Following a recent presentation by Larry Frank as well as a series of classes taught for Henry's Learning Lab here in Canada, I decided it was time to explore the value proposition of AUTO ISO, not in the traditional fully automatic mode, but as a tool for the photography enthusiast. In order to make more sophisticated cameras have the ease of use of smartphones, manufacturers took their extensive knowledge of programmed exposure and added the capability for the exposure CPU to set not just aperture and shutter speed but also ISO. They built this based upon databases of millions of sampled exposures. That’s why full auto mode works so well for so many people well over 90% of the time. Many educators recognized that just as grain in the days of film, excessive digital noise due to high ISOs could result in less than optimal images. Thus, was born the initial instructions not to trust AUTO ISO and to go set it manually. In the earlier days of digital, this was good advice, but technology changes over time and with today's cameras, the advice is now stale and less valuable. To be candid, I’m not sure that the advice helped in the long term. Setting the ISO manually prescribes intent and attention. I’ve seen many images made at ISO levels that are unnecessarily high for the situation and when discussed, discover that this was a setting made by the photographer for a situation and then forgotten. The results were often images that were less than they should have been. Since we are often easily distracted, using Auto ISO could have made for a better photographic outcome. I am well aware that there are plenty of people who will tell you as the creative that only people who shoot in full manual are truly creative. This is such a deep pile of bullcrap that the speakers should come with a large warning label that reads "This Person is Full of Sh*t". In the talk that I mentioned, Larry was sharing with his audience that he uses AUTO ISO for much of his work which is classic street shooting. Candids made quickly and respectfully. Larry advocated 1/250 shutter speed, f/8 aperture and AUTO ISO and the camera in Manual mode. Some listeners lapped it up, some retreated in horror, but there is great merit to the idea for all of us here to consider. I am one of those who has actively resisted AUTO ISO in the past. I've been changing my ways since the summer when I started using it for in the field video work and was pleasantly surprised by how valuable it was. In the last two months, I've been forcing myself to shoot stills this way and for the majority, have no concerns at all. To each his or her own of course. Let’s assume that you are shooting with a DSLR or mirrorless with at least a micro four thirds sensor size. Today’s sensors are excellent with higher ISO response and lower noise than we have ever seen. While I still hear the words, “never go over ISO 800” and “anything above ISO 1600 will be garbage”, these statements are out of date and for the most part, invalid. In a practical example, I shot the final game in a high school football championship in November of 2015. Every exposure was made at ISO 25600 because that was what I needed to get the shots. None of the image recipients ever complained about noise. To a person, they were very pleased with the images. Some ended up as large prints in the player's homes. I've also found that AUTO ISO can help you when you are working in rapidly changing light such as a forest walk. I can set an AUTO ISO range in camera that suits the subject matter, select an aperture for the depth of field that I want, and while the shutter speed will float first, it won't drop below what I set as my minimum shutter speed, and at that point the AUTO ISO starts increasing the sensitivity. It works great. This also works for bird photography where I will be in shutter preferred mode, selecting what I hope is the proper shutter speed to freeze the bird but allow some motion blur of wingtips. The camera will float the aperture, but if it gets to the point where the shutter speed selected cannot be achieved at any aperture available, AUTO ISO will adjust to compensate. This has saved me in both falling light situations, but also in a pan across a sky with heavy clouds and patches of open sun. In your camera menu system, and in some brands, you set AUTO ISO to on in the menu, in others you choose AUTO as your ISO selection. Different OEMs take different approaches, so consult your manual for your camera. Don't stop here because we have at least one more setting to make and that is the maximum ISO that you will allow AUTO ISO to use. On most cameras, this will default to the camera’s maximum native ISO. Sometimes this is fine, but some OEMs can be a bit optimistic. If the camera is less than 2 years old, ISO 6400 will be safe if the camera chooses it. If 2-4 years old, perhaps choose only ISO 3200 and if over four years old, perhaps choose ISO 1600. Some cameras will also let you set the minimum ISO that AUTO ISO can use. Choose the minimum native ISO that your camera can do. That’s going to be a number, not a name like Lo1. This gives the AUTO ISO the maximum level of ISO range that you feel is reasonable. In many cases, the AUTO ISO function will also let you set the minimum shutter speed before AUTO ISO kicks in. 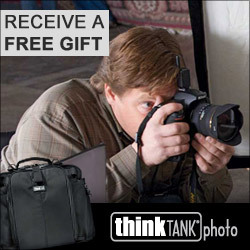 Newer cameras offer an AUTO option that bases the minimum shutter speed on the focal length of the lens in use. This can be extremely handy, especially with zoom lenses. This is your second setting to make if it exists. Some cameras, notably higher end Nikons, will also let you set a "preferred" AUTO ISO setting. This is like setting your ISO manually, and then letting the AUTO ISO use the setting as a jumping off point. It's not completely critical, but if your camera has this option, no harm in using it. The camera will then hold the preferred ISO as long as it can, before shifting off. It’s to your benefit to leverage AUTO ISO as much as possible, but not to the point where you get images that you feel have too much digital noise. Remember also that if you only share images on the computer or the web, you can be more aggressive in your high ISO choice than if your intent is to make larger prints. The resolution on monitors and on the web is very low, with the best displays being half the resolution of a pretty generic DSLR or Mirrorless camera these days. If printing is important to you, some simple testing on your part is worthwhile to find your maximum acceptable ISO. Auto ISO will generally work in all the shooting modes on your camera. In fact, it is the default methodology in the fully automatic mode, usually denoted by a green setting on the mode selector. Where you can leverage it is when you take some control of your camera, in one of the other more controllable modes such as Program, Aperture Preferred or Shutter Preferred. Changes in modern cameras even allow the use of Auto ISO in Manual mode, which has become a real benefit to photojournalists, street photographers and anyone who needs to work quickly and unobtrusively. There are some caveats around this that are addressed later, but check your camera manual if you shoot in Manual and would like to leverage AUTO ISO to see if it is supported. I had a Nikon D500 and a Canon 5Ds handy to make these menu and LCD panel captures. Your camera may use different specific controls, and have more or fewer options, but the general process can be found here. I prepared these images in conjunction with an article produced for Henry's here in Canada, but the images are equally useful here. 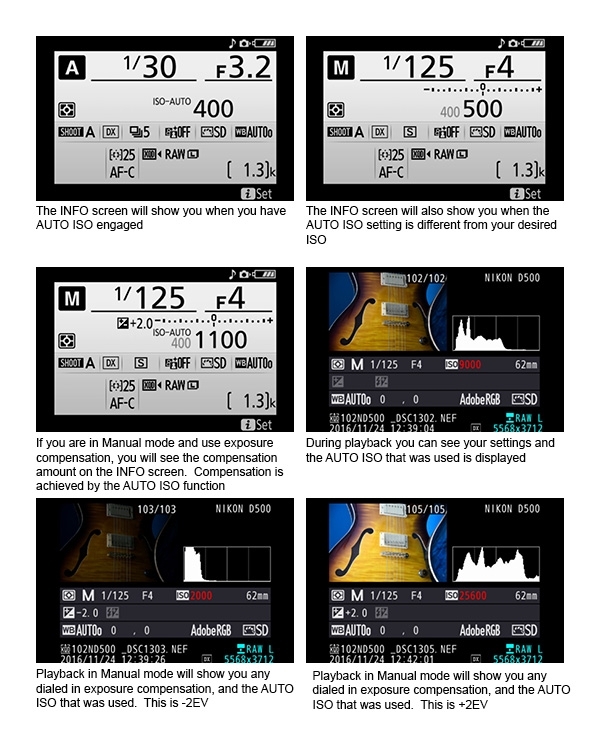 In the LCD menu captures above, you can see how rich the experience is to get AUTO ISO tuned to your needs on Nikon cameras. In the next image, you will see similar capabilities from Canon. I also very much like how both Nikon and Canon provide information when using AUTO ISO on the INFO screens and also how they show the function of exposure compensation when shooting the camera in Manual mode. Being able to use exposure compensation while in Manual mode with AUTO ISO sounds complicated but is quite simple and very useful indeed. If you choose to put the camera in manual mode with AUTO ISO, remember that to make exposure compensation work, you cannot just modify the shutter speed or aperture, because the AUTO ISO will shift to balance your changes. Some manufacturers support the use of the exposure compensation feature in Manual for this reason. If you shoot in Program, Shutter Preferred or Aperture Preferred modes with AUTO ISO, the exposure compensation button or dial will still make shifts as you desire. However, Manual mode may take over controls otherwise used for exposure compensation. Most Nikons have a dedicated button for exposure compensation. Where many Canons do not, they will often have a Q button when using the LCD INFO screen, so you can quickly get to the exposure compensation setting and adjust it from there. Other vendors may offer a number of programmable Fn buttons and I like to make one of them Exposure Compensation if a dedicated exposure compensation button does not exist. In the examples in this article, I show LCD images from both Canon and Nikon cameras on how exposure compensation looks and works when the camera is Manual mode. When using exposure compensation in Manual mode, the compensation setting causes a change in the auto assigned ISO to preserve the shutter speed and aperture that have been explicitly set. There is always a segment of the community that distrusts automation at some level. If that's you, no pain no foul. I was initially reluctant to use AUTO ISO myself, but after experimenting I find it very handy in select shooting situations, particularly where I want to work quickly and unobtrusively. The worst thing that can happen is that you give it a try, if you don't use it already and discover that it's not a function that you would use. Then again, you may discover, as I have, that it's a useful tool to have available when the shooting scenario will benefit.